Genuine, factory brand Remington Model 870 12 Gauge Magazine Extension Kit increases mag tube capacity by 2 extra rounds, to fit the 18" barrel. All-steel extension tubes attach directly to the end of the magazine tube. Includes a magazine clamp, although that piece is not used with the BPU870 conversion kit. Magazine spring is formed from high strength music wire that resists "set" and won't weaken over time. Matte blued finish. Genuine, factory brand Remington Model 870 12 Gauge Magazine Extension Kit increases mag tube capacity by 3 extra rounds, to fit the 20" barrel. All-steel extension tubes attach directly to the end of the magazine tube. Includes a magazine clamp, although that piece is not used with the BPU870 conversion kit. Magazine spring is formed from high strength music wire that resists "set" and won't weaken over time. Parkerized finish. Genuine, factory brand Remington Model 870 12 Gauge Magazine Extension Kit increases mag tube capacity by 2 extra rounds, to fit the length of the 18" barrel. All-steel extension tubes attach directly to the end of the magazine tube. Includes a magazine clamp, although that piece is not used with the BPU870 conversion kit. Magazine spring is formed from high strength music wire that resists "set" and won't weaken over time. Parkarized finish. An extended switch on the KSG is easier to "find" than the original, which leads to faster magazine-tube transitions. Machined from Aircraft 2024-T3 Billet Aluminum, and Black Hard Anodized to Military spec MIL-A-8625 Type III Class 2 for Steel like Strength. Easy to install yourself with simple to follow directions and Allen Key included. This Switch if for the "Gen 2" or "Gen 2.5" KSG's (which is most of the KSG's on the market. But see the pictures for the differences). KSG shell deflector eliminates the painful complaint that some KSG owners have with these awesome bullpup shotguns - getting their forearms burned by hot, spent shells! With this deflector, the spent shells eject at a 10:00 - 11:00 downward angle, never hitting your arm. In the left handed models, the shells eject at a 1:00 - 2:00 downward angle. A 90-degree side rail that positions a two slot picatinny rail in the optimal position for a side-saddle, or other rail accessory. This side rail is intended for the Bullpup Unlimited conversions, but will work for other platforms with picatinny rails if the side clearance is enough to accept the mount. Designed to be symmetrical, so it can be mounted for use on either side of the firearm. Durable polymer construction, but weighs just under an ounce. All metal! Fast and convenient magazine changes and the ability to carry up to 100 rounds of 5.7mm ammunition on the PS90 (or P90). Precision machined from 6061-T6 aluminum with Mil-spec anodized finish in Black. These items are restricted in some locations. Please don't order if you're in one of those areas! Re-stocking fees may apply!! Intended for the AR15/M16, it also fits the AUG (NATO stock), M17s, and the Tavor. Will NOT fit the FS2000. These items are restricted in some locations. Please don't order if you're in one of those areas! Re-stocking fees may apply!! Polymer coupler for fast and convenient magazine changes and the ability to carry up to 100 rounds of 5.7mm ammunition on the PS90 (or P90). Rugged and durable Nylon/Carbon-fiber material in matte Black. Did your PS90 come with a 30-round magazine? Replace the limiter with the Percival Armaments Locking Plate, and give it a 50-round capacity! Quick and easy fix!! Certain magazine capacities are restricted in some locations. Please don't order/install this item if you're in one of those areas! Re-stocking fees may apply!! The Lancer 30-round, magazine design includes a one piece, wrap-around steel feed lip assembly and an aggressive surface texture to create the ultimate hybrid magazine tough enough for military, LE and commercial use. Designed, tooled, manufactured and assembled in the USA! The PMAG 40 GEN M3 features a long-life stainless steel spring, four-way anti-tilt follower and constant-curve internal geometry for reliable feeding, and simple tool-less disassembly to ease cleaning. Now available in SAND! More than just a color change...Magpul made the most reliable magazine on earth even stronger. The PMAG 40 GEN M3 SAND is ideal for desert environments and with common paints and fabric dyes can be adapted to any environment. These items are restricted in some locations. Please don't order if you're in one of those areas! Re-stocking fees may apply!! • 5.56NATO/.223 • 30 round capacity • Impact and crush resistant polymer construction • Constant-curve internal geometry for smooth feeding • Anti-tilt, self-lubricating follower for increased reliability These items are restricted in some locations. Please don't order if you're in one of those areas! Re-stocking fees may apply!! Magpul 30-round, impact, and crush resistant polymer construction magazine has a constant-curve internal geometry for smooth feeding. Anti-tilt, self-lubricating follower for increased reliability. Multi-use Impact/Dust Cover keeps dust and dirt out of the magazine during storage and protects the feedlips from potential hard impact damage during transit. Black-oxide coated (MIL-DTL-13924D) USGI-spec stainless steel spring, with transparent MagLevel windows on both sides of the body, and a painted indicator on the spring allows for easy determination of rounds remaining. Textured gripping surface and flared floorplate for positive magazine handling and easy disassembly. The British SA80 Bullpup magazine. The Percival Armaments 12ga Shell Card is made from Mil-Spec webbing, with hook-velcro on the back, a paracord loop, and holds up to six shells. The length matches perfectly with the KSG Shabrack for a convenient side-saddle set-up. These Shell Cards fit nicely into 5.56 ammo pouches. 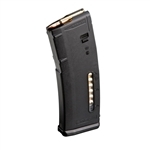 The PMAG 30 AUS GEN M3 Window is a 30-round 5.56x45 NATO polymer magazine for Steyr® AUG/F88/F90. The new magazine features transparent windows to allow rapid visual identification of approximate number of rounds remaining. 20 round black Zytel nylon magazine for FN/FAL METRIC pattern rifle 7.62x51 .308 cal. The newly designed FN/Fal magazine fits the Kel-Tec RFB. These items are restricted in some locations. Please don't order if you're in one of those areas! Re-stocking fees may apply!! 10 round black Zytel nylon magazine for FN/FAL METRIC pattern rifle 7.62x51 .308 cal. The newly designed FN/Fal magazine fits the Kel-Tec RFB. These items are restricted in some locations. Please don't order if you're in one of those areas! Re-stocking fees may apply!! Thermold 5-Round FAL-METRIC Magazine for the RFB (308/762NATO). Perfect size for hunting or bench shooting!